When an adult person decides to learn more about the Catholic faith, or to join the Catholic Church, a process is available called “The Rite of Christian Initiation of Adults”. It is a journey of several months during which we explore as a group what it means to be a Catholic Christian. We have weekly meetings beginning in September and continue until Easter (in early Spring). Those who wish to enter the Church receive the sacraments of Baptism, Confirmation and First Communion at this time. Parishioners take part in ongoing discussions. For further information, contact the Parish Office at 416-221-8866. Children who are over the age of 6 who have not been baptized in the Catholic Church are welcome, with the consent of their parent(s), to enter this process of preparation for Baptism or full membership in the Catholic Christian community. The process lasts most of one year, and involves small group meetings, participation in Sunday Eucharist and the Church’s rites which mark the stages of the development of faith. Baptism and reception into the Church are usually celebrated at the Easter Vigil on Holy Saturday night. Children preparing for baptism through the RCIC will receive also the sacrament of the Eucharist as part of the sacraments of initiation. Those interested are asked to contact the parish office to initiate the process. 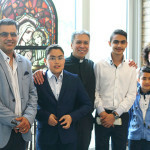 The Archdiocese of Toronto requires that children be baptized in the Parish where their family is registered and where they attend Mass. Baptism celebrations at St. Gabriel’s Passionist Parish for infants and children under the age of 6 are held on the third Sunday of each month at 2:00 PM. 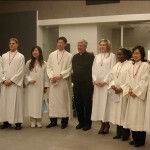 In December the Baptism celebration is held on the second Sunday. 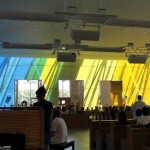 Prior to the child’s baptism, parents or expectant parents of first-born children participate in a preparation session. Through this preparation, parents examine their understanding of baptism, what it means to have their child baptized, and the responsibilities of doing so. These sessions are usually held on the Monday before the baptism at 7:30 PM here at the Church. To reserve a date for your child’s baptism, and to register for the preparation session, please come to the Parish Office, which is open on weekdays from 8:30 AM to 12:00 Noon and from 1:30 PM to 4:30 PM.